A masterly epic that weaves a contemporary search for a missing father with a vivid story from the heyday of the British Empire. Liv, a Canadian filmmaker, is writing from a Tahitian jail, piecing together her troubled past and her family's buried history for the unknown daughter she gave up at birth. The search for her own father, a pilot missing since the Korean War, has brought her to the South Seas and landed her behind bars on a trumped-up murder charge. In the stillness of her cell, Liv ponders the secret journal of her ancestor Frank Henderson, who came to these same waters a century before on an extraordinary three-year voyage with Queen Victoria's grandsons--Prince George (later George V) and Prince Eddy, who would die young and disgraced, linked by the gutter press to the Ripper killings and many other scandals. 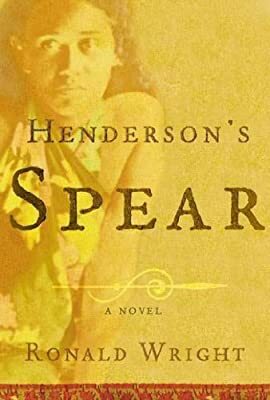 Through unforgettable characters and a mesmerizing story, Henderson's Spear traces two tales of obsession, intrigue, and loss--from the 1890s and the 1990s. These stories reach around the world from Africa, England, and North America to converge with compelling effect in the Polynesian islands. With a deep understanding of the landscape and culture of the South Sea Islands, Ronald Wright's Henderson's Spear explores the patterns of history and the accidents of love.